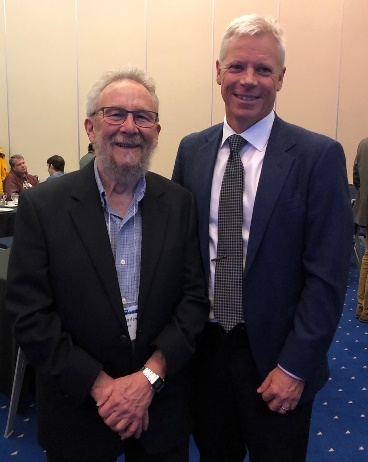 Professor Emeritus, J. Harley Weston was named a Canadian Mathematical Society Fellow in CMS Meeting Banquet in Vancouver. Congratulations Dr. Weston!! Ms. Charlayna McGill (BSc. in Actuarial Science) received the Faculty of Science Dean's Medal at Spring Convocation. Dr. Andrei Volodin considers the probability of people getting cannibis licenses in Saskatchewan. Published in the Leader Post, June 7, 2018. See the article for complete details. 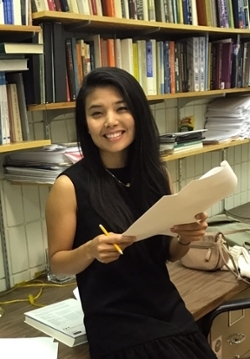 Thuntida Ngamkham has been selected as the 2017 University of Regina recipient of the Governor General's academic gold medal. This award recognizes the most outstanding academic performance of a graduate student. Dr. Saroup Kaul, Professor Emeritis, passed away May 10, 2018. The following memory of Dr. Kaul is from Dr. Jim Tomkins. I was deeply saddened to learn that Saroop Kaul had passed away. I had the good fortune to be taught complex analysis by Dr. Kaul during my final undergraduate year at the University of Saskatchewan. He was always well-prepared for class and he presented the material clearly. In addition, at a time when interactions between students and their professors was much more formal than today, Dr. Kaul was approachable; he seemed to enjoy getting to know his students outside the classroom and was easy to talk to. 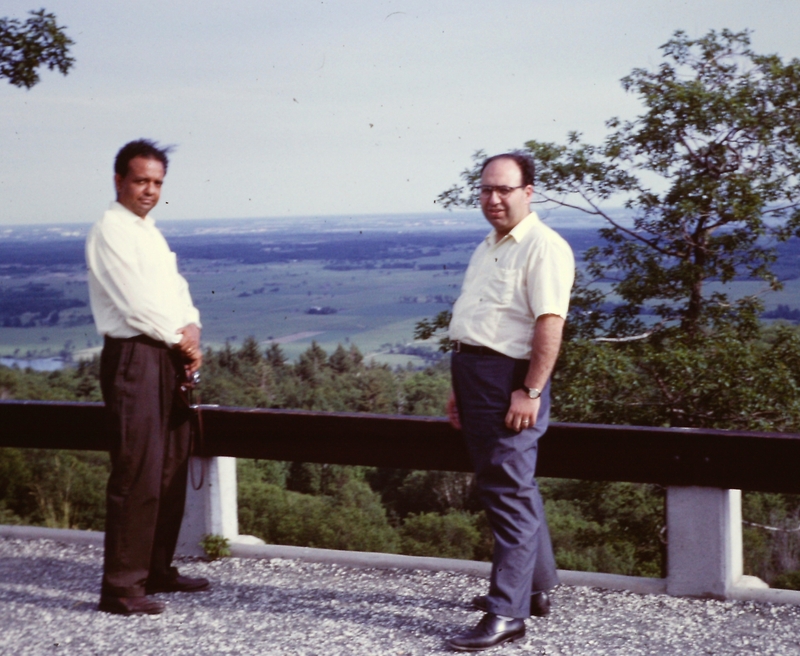 When I became a faculty member in Regina in 1969, I wasn't aware that Saroop had moved from the Saskatoon Campus of the University of Saskatchewan to the Regina Campus – and I was pleased to become re-acquainted with him. Indeed, he and I were next-door neighbours in College West for many years, after the math department moved out of the Library. We had many conversations over the years and I always enjoyed his company. In my mind’s eye, he is smiling. He was a congenial colleague, a scholar and teacher respected by students and faculty alike. I offer my deepest condolences to the Kaul family. To read me about Dr. Kaul, please see the obituary. 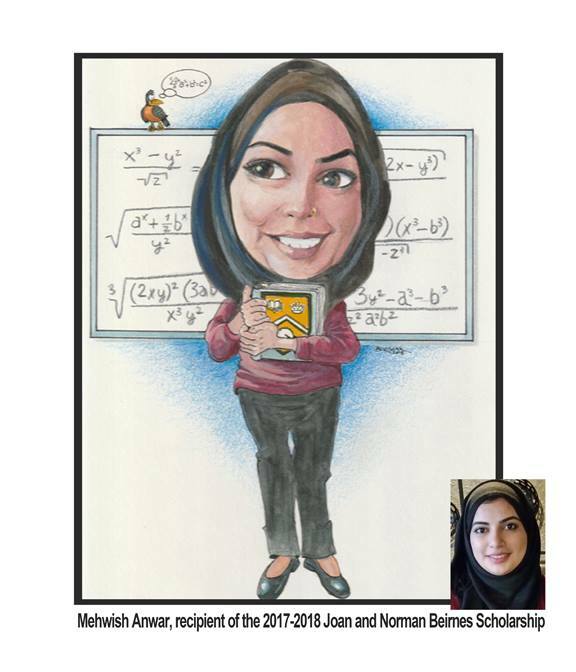 Mehwish Anwar, recipient of the 2017-18 Joan and Norman Beirnes Scholarship. Congratulations Mehwish! 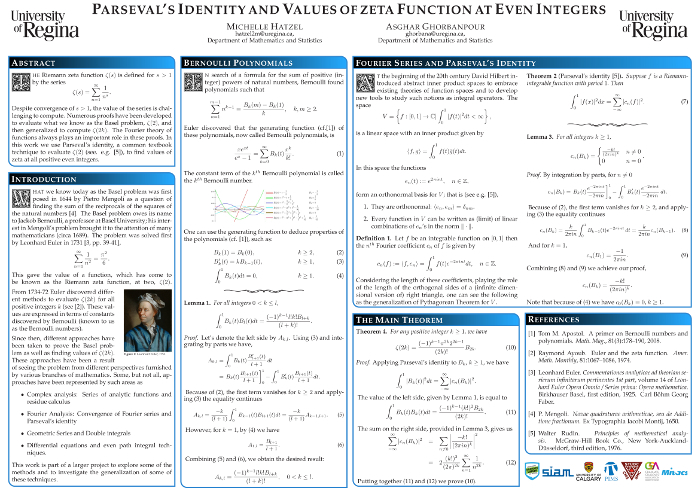 Michelle Hatzel, a second year student, presented a poster at the Calgary Applied and Industrial Mathematical Sciences Conference. This poster is a collaboration between Asghar Ghoranpour and Michelle Hatzel. The following is the poster abstract. The Reimann zeta function ζ(s) is defined for s > 1 by the series . Despite convergence for s > 1, the value of the series is challenging to compute. Numerous proofs have been developed to evaluate what we know as the Basel problem, ζ(2), and then generalized to compute ζ(2k). In this work we use Parseval's identity, a common textbook technique, to evaluate ζ(2), to find the values of zeta at all positive integers. Marzeih Bayeh has been selected as the 2017 U of R recipient of the Governor General's academic gold medal. This award recognizes the most outstanding academic performance of a graduate student. Kian Blanchette, recipient of the 2016-17 Joan and Norman Beirnes Scholarship. Congratulations Kian! 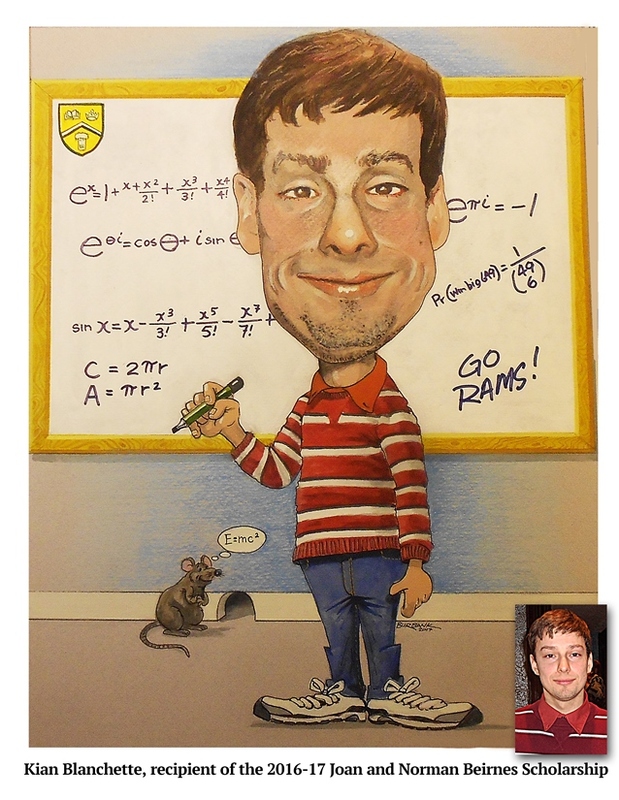 Professor Emeritus, Harley Weston was interviewed by the Saskatchewan Mathematics Teachers' Society Spotlight on the Profession. See the article on the SMTS website. Patrick Maidorn has been awarded the Mathematics Education Prize from the Pacific Institute for the Mathematical Sciences. 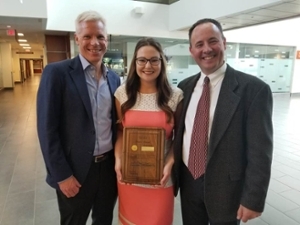 See http://www.uregina.ca/external/communications/feature-stories/current/2016/05-20.html for details about Patrick's accomplishments and the award. Dr. Bruce Gilligan and his recent PhD student, Dr S. Ruhi Ahmadi, have had their December 2014 article "Complexifying Lie group actions on homogeneous manifolds of non-compact dimension two" recognised as one of the top papers in the Canadian Mathematical Bulletin. Two retired faculty members, Dr. J. Chris Fisher and Mr. Norman Beirnes, have generously established scholarships for undergraduate and graduate students. The first recipients of these awards are Adam Gorr, a third-year Mathematics major, who received the Joan & Norman Beirnes Scholarship in Mathematics and Statistics, and Mizanur Rahaman, a first-year doctoral student, who received the Mathematics and Statistics Graduate Entrance Award for International Students. Dr. Donald Stanley has been appointed to the NSERC Discovery Grants Evaluation Group for Mathematics and Statistics, and Dr. Michael Kozdron has been named the University of Regina liaison for the PIMS Postdoctoral Stochastic Training Centre. Dr. R. James Tomkins, former Head of Mathematics & Statistics and President of the University of Regina, has been named the eighth Chancellor of the University. Dr. Tomkins, a distinguished academic and a tireless contributor to the University, will assume his new role on July 1, 2013, for a three-year term. For further details, please see the formal announcement: http://www.uregina.ca/external/communications/feature-stories/current/fs-06102013-2.html.